In stores March 26 from Image Comics. Based on the screenplay by LARRY FESSENDEN and ROBERT LEAVER. Artist BRAHM REVEL began his association with Glass Eye Pix in 1999, adapting and illustrating Fessenden's WENDIGO screenplay into a comicbook. This was followed by design and animation work for various Glass Eye Pix film projects, including Ti West's THE ROOST, THE WENDIGO animated series (in development), Fessenden's THE LAST WINTER and Glenn McQuaid's I SELL THE DEAD. Other Revel/Glass Eye Pix graphic collaborations include the Halloween and Valentine's Day "advent calendars", as well as the comicbooks WHAT ARE YOU VOTING FOR? created for the 2004 election, and the forthcoming adaptation of I SELL THE DEAD. Master Brahmus is currently at work on his own original 9-part series entitled GUERILLAS for Image comics, and resides in cyberspace at elrevel.com. 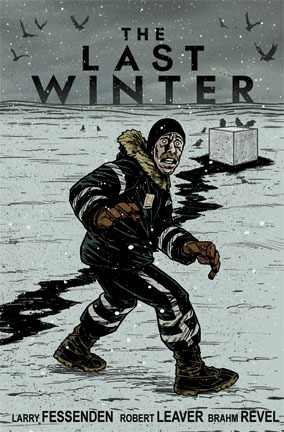 THE LAST WINTER was started in the Fall of 2001 and written over several months. I approached Robert Leaver to help me with the task. I wanted to make a movie that took place in the snow, and continue with some themes left over from my previous film WENDIGO. I wanted to tell a story about how our world view effects the way in which we solve problems and deal with a crisis. I wanted to make a horror movie about the planet’s climate collapsing and no one doing much about it until way past too late, which is kind of what’s really going on. Robbie and I wrote a pretty solid first draft and I presented it to my producer Jeff Levy-Hinte. He started trying to raise money from the small film studios that make off-beat movies. Every one of them said the movie would be a “tweenie”—in between genres—not horror, not drama, and passed. My producer was determined to keep up the momentum on the project, and in March 2003 he flew us out to Alaska, to Prudhoe Bay where the film takes place, where the oil is still flowing from wells jutting out of a frigid barren landscape. There’s one hotel in Prudhoe Bay and it’s filled with oil men: tough, seasoned burly guys with a military sensibility. We were there two days into the war with Iraq, and the TVs in the mess hall had Fox News and CNN playing loud those first several hours of shock and awe. Levy-Hinte and I were able to take a local guide out onto the National Wildlife Refuge and see the land where everyone wants to drill. It was vast and white and you could really die out there. When I got back to the States, I told Robbie we had to rewrite the script to be more true to the land and the details of the place, and Jeff and I worked on technical things we’d learned about oil and ice roads and we became determined to make the movie. We hired a crew to shoot B-roll of winter landscapes in Alaska. But still, no financing for the feature. Around then I called on my design partner Brahm Revel and he started drawing concept sketches based on the photos Jeff and I had taken up North. Brahm and I designed everything from the station to the blind to the corpse to the monster. Brahm started doing storyboards of the script and one day Jeff told me he found enough private investors to get the film made. I wanted Ron Perlman to play Pollack because Perlman can play a villain you love, and above all I wanted Pollack’s humanity to show through the bluster. James Le Gros is underused in movies, and I say that should change if anyone actually sees this film. We shot for 35 days in Iceland, employing an all-Icelandic crew of robust and gracious artisans. The weather was grueling, location remote, and time was scarce, but when it was over I felt that we had gotten something like 80% of what I had pictured when writing the script, which for me is pretty good. Postproduction brought visual effects, sound design and a striking score by Jeff Grace into the mix. The film premiered September 2006 and was released a year later. 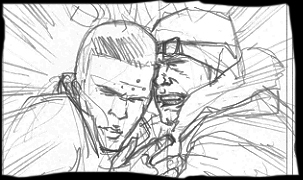 Meanwhile Brahm had sprung from the storyboards to an ambitious translation of the script into comicbook form, and we hoped to find a publisher as we had done with our first collaboration, WENDIGO. We were lucky to find Image. The text in this volume is from an early version of the script, and it still retains scenes that were subsequently cut, either during production or in post. Also, since it’s a comicbook, and because Brahm wanted it and knew I would never object, there’s more monster in this telling than in the finished film. I say bring ‘em on! As for global warming, there’s a lot of talk out there on the topic, and some selfish and ignorant parties have turned it into a partisan issue. But the planet is not waiting for people to wake up. The planet will do just fine, it’s people that will be toast. I host a site on the issue, come by and visit some time. It’s a reminder that horror is not a genre. It’s a reality.